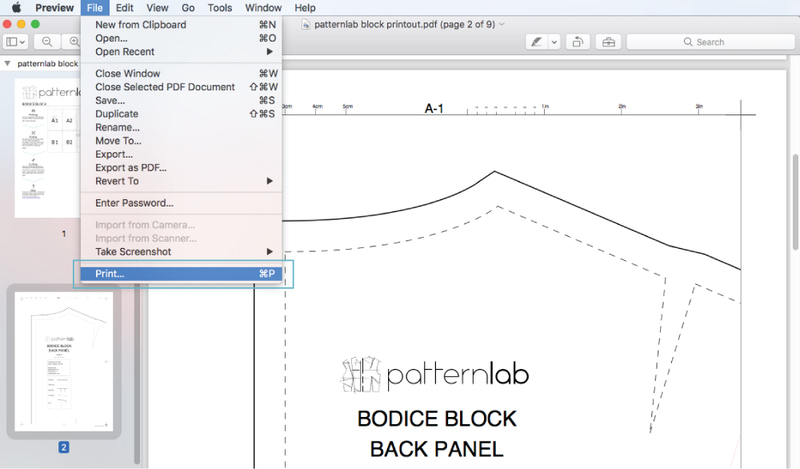 So you’ve downloaded a PDF Basic block pattern… great! But how do you print it out so you can actually use it? Well this guide should help you do that so you can start using your accurately fitting blocks to make some gorgeous garments. Unfortunately we don’t all have a large format printer at home, so we need some way of getting our patterns to print from home or the office and this is where PDF patterns come in handy. 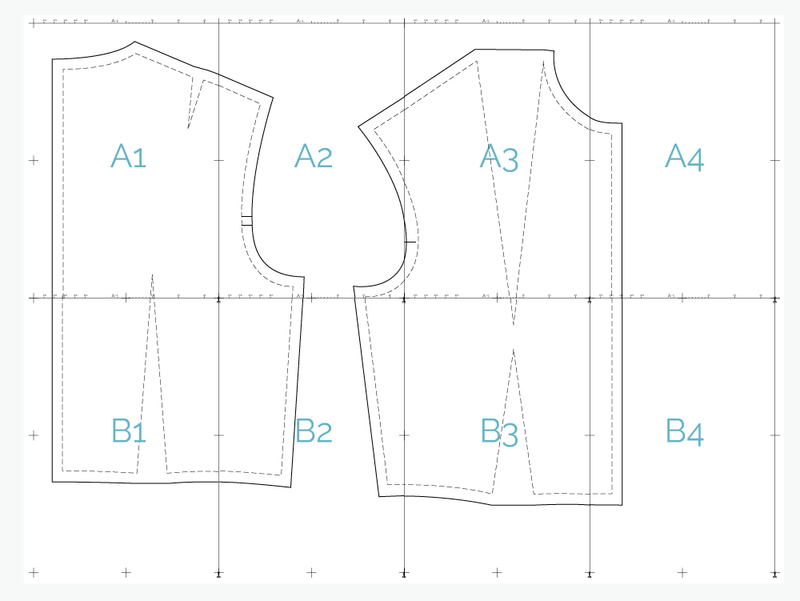 A PDF pattern downloaded contains your full scale pattern broken up into multiple pages, that can be printed individually and then pieced together to form the whole pattern. 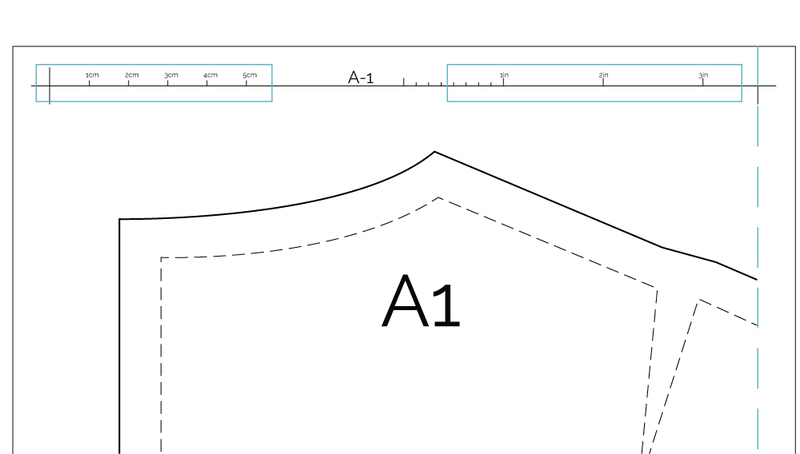 Here at Patternlab, we offer a whole range of PDF paper sizes for you to choose from when it comes to downloading your PDF pattern: A0, A1, A2, A3 or A4 and US Letter. Most home printers accept either US Letter, A4 and in some cases A3, so we recommend selecting from one of these when downloading your pattern. If you have access to a print shop with the facilities to print A0, then go for that! It’s much less work in the long run, especially when it comes to piecing your individual pages together. All home printers are different and have their own individual settings, so we’ve put together a short guide that will help you ensure you print your patterns to the correct scale. If the pattern is printed at the wrong scale the basic block produced from it won’t fit. Before you start, download Adobe Reader it’s not only free but it’s also the market leader and it will let you open, view and print your PDF patterns. Once you’ve installed Adobe reader, go ahead and open up your PDF pattern. Next select FILE > PRINT in the main menu to open up the print settings (top left on the menu bar). Choose the correct paper size from the drop down list in the print dialogue box. 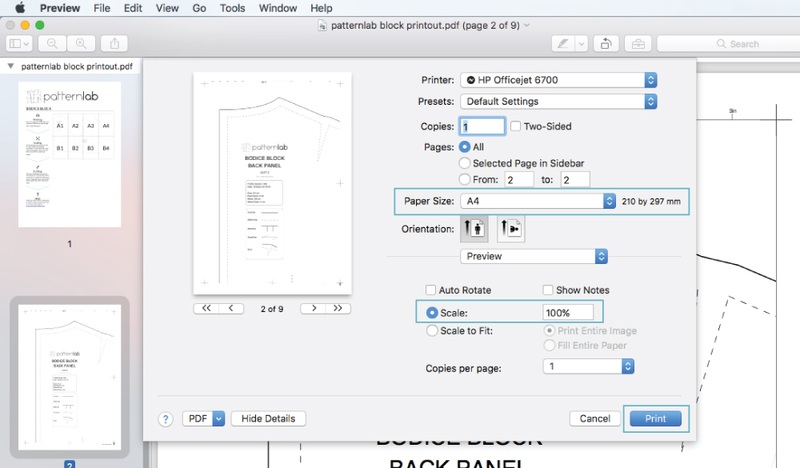 Make sure the paper size you select here is the same as your PDF download. It will either be US Paper size, A4, A3, A2, A1 or A0. Next, click the scale radio button and type 100% in the input box. Never scale to fit as this will warp the scale of your pattern. When you’re ready click print. Making sure you pattern printed to the correct scale is top priority and should be done before piecing your patterns together! 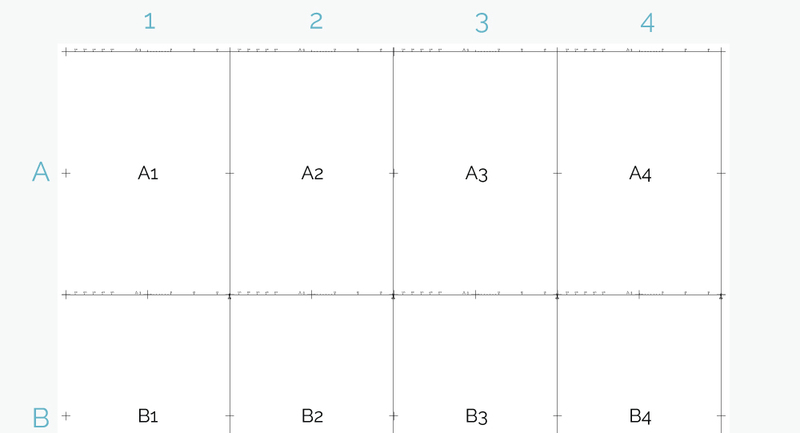 Individual pages are ordered using a simple grid. The top row of pages is labelled A. The second row B, the third C etc. The first column is labelled 1, the second 2, the third 3 and so on. The amount of rows and columns depends on how big your pattern is. We use this grid to position the pages in the correct order. You can find the page number at the top of each page. Each page has a border, allowing your pattern to fit neatly within the your printers available printing area. However, this means you must trim the right side of each page so it will match neatly up with the next. Cut along the right hand edge of the document, marked by a thick line and a pair of scissors (bottom right edge). Make sure you don’t cut into the lines of the pattern or the + registration marks. Piece your pages together in sequence joining A1 to A2 then A2 to A3, etc. Make sure the + registration marks and pattern lines, line up correctly. Once in position sellotape them together. We found it easier to sellotape one at a time. For best results use Scotch tape. It’s less sticky than most sellotapes allowing you to remove it if you make a mistake. Once you’ve completed the top row of pages start on the second, continuing this process until you complete all rows: A, B, C, etc. 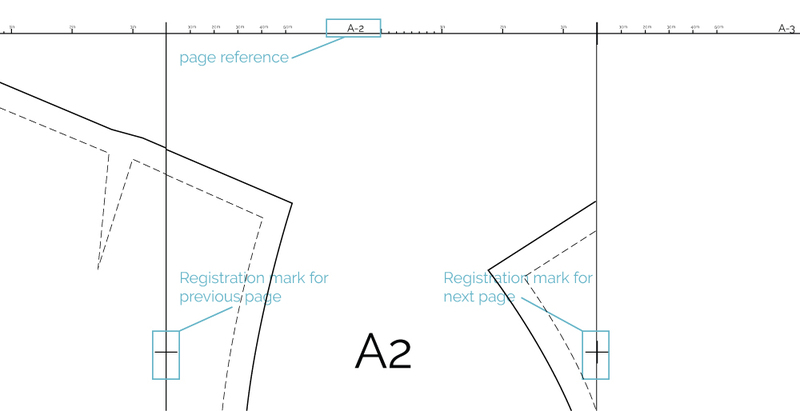 Finally, remove the bottom edge of each row, using the registration marks and pattern lines as a guide. Line the top row up with with the row below it and secure with sellotape. Once you have stuck all your rows together you should end up with a finished pattern, similar to the one below. To use your pattern, cut out your pattern pieces along the thick outer edge. 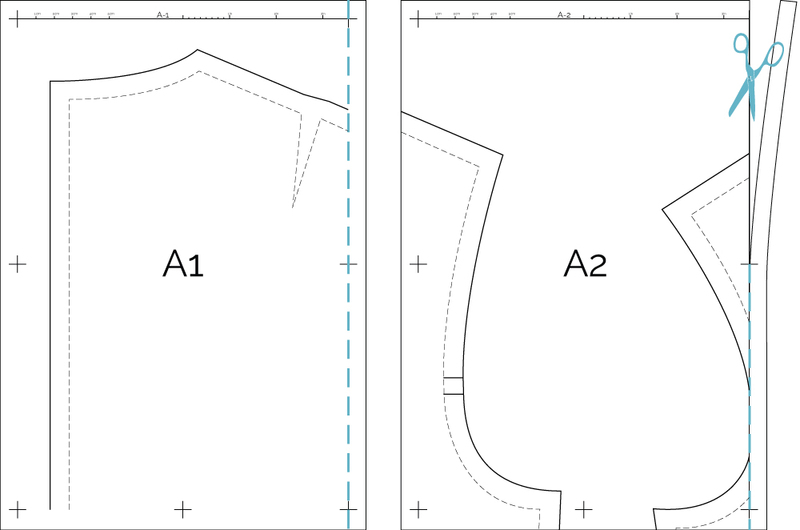 The dotted line within the pattern piece is the seam allowance.